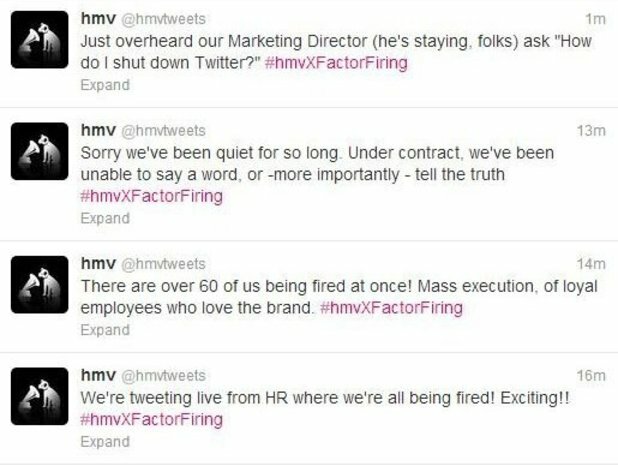 Last week, some of HMV’s staff got hold of their official Twitter account, and made their feelings about the redundancies in their department known. It’s the top one that gets me. “How do I shut down Twitter?” Obviously the answer is that you can’t. But if you’re in an organisation where tweets get signed off, where some people are afraid of what staff would say if they got hold of the social media feeds, your charity might be missing an opportunity. Stories told by the people they affect are powerful. Staff who are both trusted and trained can amaze you. What would happen if you gave your Twitter password to service users or staff? And if you’re a charity CEO who feels queasy at the thought, maybe this will help.